Season Mode that allows players to enjoy a full single-player experience. Extensive Battle-Car customisations with more than 10 billion possible combinations. Unlockable items and vehicles, stat tracking, leaderboards, and more. Addictive 8-player online action with a variety of different team sizes and configurations. Amazing 2, 3, and 4 player splitscreen mode that can be played locally or taken online against other splitscreen players. Winner or nominee of more than 100 game of the year awards, Rocket League is one of the most critically-acclaimed sports games of a generation. Boasting a community of more than 12 million players, Rocket League is a high-powered hybrid of arcade-style soccer and vehicular mayhem that offers easy-to-understand controls and fluid, physics-driven competition. Rocket League includes more than 100 billion possible customisation combinations, a fully-featured offline season mode, multiple game types, casual and competitive online matches, and special "Mutators" that let you change the rules entirely. This futuristic Sports-Action game equips players with booster-rigged vehicles that can be crashed into balls for incredible goals or epic saves in this unbelievable, high-octane re-imagining of association football. Choose from a variety of vehicles to drive and customise in this football-meets-destruction derby team sport and master the skills you’ll need to fire home the goals. Soar highinto the air to perform daring acrobatic strikes and daredevil saves, or use aggressive tactics to take down rival players at supersonic speeds. 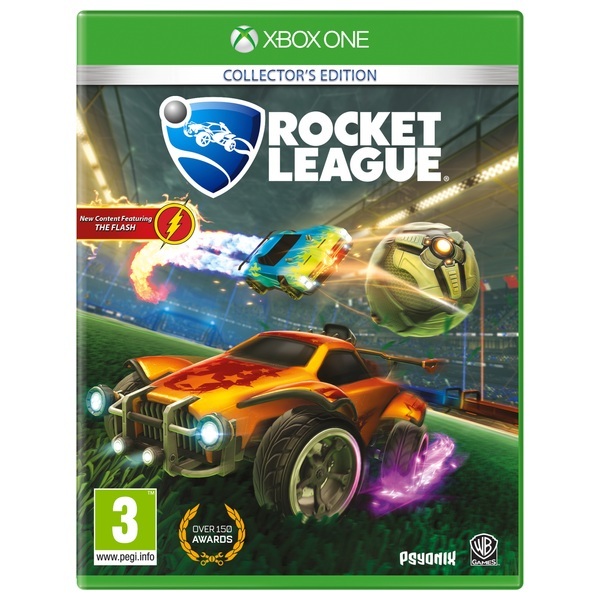 Rocket League Collector’s Edition includes: the base game and additional DLC content including ‘Supersonic Fury’, ‘Revenge of the Battle-Cars’ and ‘Chaos Run’.